I find it kind of funny that most guidebooks to the Uintas calls anything more than 10 miles from the trailhead “remote”. However it didn’t really dawn on me until this trip. We’ve only seen a handful of people, and only then in a single place (Dead Horse Lake). We haven’t seen a human soul otherwise in the six days we’ve been out so far. Sheep and cows, of course. Elk. Mule deer. Mountain goats. And today, a mama moose! 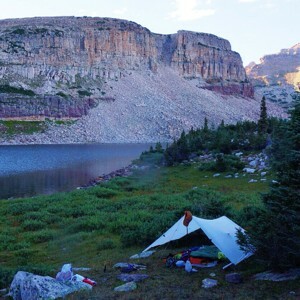 I awoke this morning to an eerie grayish orange alpenglow on the mountain cliffs west of my tarp. I didn’t think much of it until realizing that the gray was from storm clouds that were beginning to let loose on us. Fortunately it only rained for a half an hour or so but the wind and cold made me pull my quilt over my head. The next time I woke up the skies were blue and the sun had warmed our camp in the Reconnaissance Lake basin. 1. Take a photo of the morning light at whatever view was visible out of the front of my tarp. 2. Pour water in the Jetboil, fire it up, and make coffee. 3. Read, pray, and write until the others woke up. We descended from Reconnaissance Lake down its outlet stream to the quaint Triangle Lake, which sits on a dramatic bench with an expansive view of the basin to the south. At Triangle Lake one can follow the easy tundra and sparse talus down its outlet stream to the trail in the trees, or climb northwest through talus and cliff ledges to a high bench. We chose the latter. It’s prettier and not terribly strenuous to get up or down from it. We arrived at Helen Lake, and the first bit of trail we’ve seen in a few days. Helen marks the start of the Lady Lakes chain that consist of lakes named after presumably memorable women: Margie, Rosalie, Gladys, and Helen. It should not therefore be so surprising that right next to Helen is a lake called … Lightning! A tribute to the feistiness of our girls, no? We took a long break at Helen to fish. We caught several big, fat brook trout here in the shadow of Peak 12,622 which provides a breathtakingly scenic backdrop to Helen Lake. From Helen Lake, we climbed up to 11,000+ feet again and traveled south along the bench past Gladys Lake. Emerging from scrub trees while hiking, I was alarmed by a big dark brown animal in the trail perched up on stilts. It took me a moment to register that it was a mama moose. She … (walked, scampered, gangled?) off in the trees clearly looking alarmed so we were nervous that she might have a calf nearby. As we continued on the trail, she emerged from the scrub trees about 25 feet from me in a full trot back to where we had spooked her. It was freaky to have her that close. She returned to her “spot”, stared at us to make sure we would be going along our way, and started munching willows in contentment. We storied on to the south. We left the trail again just north of Rosalie Lake and made our way along the base of a cliff band to Margie Lake for camp. Margie Lake is surrounded by mountains in a very scenic bowl. Our camp is situated back from the lakeshore with Peak 12,070 looming above. Chase and Dan are pitched in the tundra on the lake’s bench, while my tarp is slightly higher tied to a few trees and willow bushes and protected a little from the winds in the open terrain here. We had fast fishing for pan-sized brook trout here, and they indeed ended up in the pan. The fish here are healthy with pink meat. Chase cooked them quite plainly with satisfaction, I took a more culinary path. The three trout I kept were first poached in a fry bake. After draining the water and deboning the fish, I added a mix of rehydrated Harmony House veggies (onions, mushrooms, and tomatoes), some Montreal Steak seasoning, a bit of oil, and fried the mixture. That was then sporked onto a tortilla and powdered with Parmesan. Photo: Tarp camp at Margie Lake.